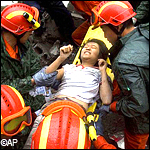 The tragic earthquake in China has provided an extraordinary example of how a variety of new digital tools and technologies have dramatically changed the way we perceive, learn about, and – through media and culture — socially construct the narrative and reality of catastrophe. The natural disaster has caused overwhelming and widespread damage in a fairly remote area of Sichuan province and revealed that many public buildings were not built to withstand an earthquake of this intensity. Many of the dead were in schools that collapsed and, according to reports, left thousands of students and teachers trapped and dead. What I wanted to point out is that, alongside the tragedy and obviously deficient infrastructure, a fairly elaborate and advanced digital culture thrives. Consequently, while some cell phone service has been interrupted, an almost instantaneous and extensive use of various digital tools has unfolded. Start with this link to the Poynter Center for an early rundown of how horrible, natural disasters unfold in the age of cell phones, Twitter, Youtube, blogs, streaming audio and video, video sharing, news aggregators, social networking and everything else. I have seen some interesting examples today of how Twitter in particular has emerged as a major source of news and information for concerned friends and family members in China and around the world. I wouldn’t want anyone to think that, in pointing out deficiencies in Chinese infrastructure, I had forgotten, or will ever forget, the race and class based infrastructure deficiencies existing here in the United States that were very much a part of why and how Katrina happened. Previous Previous post: Hi Mom. Don’t Mind the Gunfire on the Answering Machine. It’s Just War.